Features: High performance, Efficient, Cost effective, Excellent finish, Available with long handle. 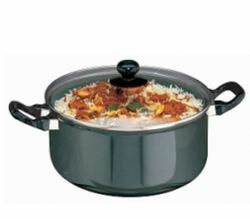 Bhupinder Singh And Sons Cookware Pvt. Ltd.
Hard Anodised The Futura Stewpot is a modern version of the traditional Indian patila or degchi (a deep cooking vessel). In these Stewpots you can conveniently cook rice, dal, curries and many popular desserts such as Firni, Sooji Halwa and Ras Malai. 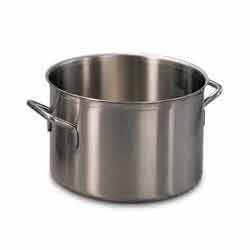 The elegant Stewpots may be used for cooking as well as serving on the table. - Computer Code No. SN01. - Made of thick sheet with fixed handles on both sides. - Cover is also fixed with handle. - Finishes : Frosted and Glitter. - Thickness of Sheet : 3.5 mm to 4mm.